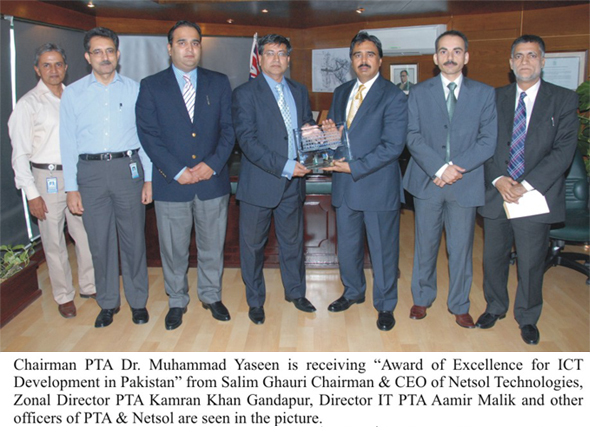 In recognition of his significant contributions for the proliferation of various Information Communication Technologies (ICTs) in the country, the 2010 NetSol Technologies ICT Excellence Award was presented to Chairman Pakistan Telcommunication Authority (PTA), Dr. Mohammed Yaseen. In this regard a ceremony was held at NetSol IT Village, Lahore President Netsol Technologies Mr. Salim Ghauri presented the award to Chairman PTA. NetSol Technologies ICT Excellence Award was held in connection to identify the most outstanding contribution towards ICTs. Dr. Mohammed Yaseen with his untiring efforts has made regulatory body a model organization in the Asia Pacific Region. He has participated in the international fora and supported the cooperation in a variety of areas, such as promotion of ICT market, telecom market liberalization, legal and regulatory framework for the telecom sector. His major achievements during the past years include introduction of consumer protection structure for telecommunication subscribers, development of multiple international communication links, provision of free Internet dialup services to the masses, establishment of 350 tele-centers as a rural telephony project, giving a special emphasize on progress and development of broadband services in the country, introduction of a unified regulatory framework for mobile banking services, launching of new systems for effective resolution of Mobile SIMs issues, arrangement of local Internet peering point between International Bandwidth providers, transition of Pakistan’s ccTLD (.pk) and initiatives to engage key industry players for enhancing local ICT content market. President NetSol technologies applauded these significant milestones achieved by the Chairman PTA and appreciated his continuous efforts for ICT development in Pakistan. Chairman PTA presented his word of thanks to NetSol technologies on this award and emphasized on mutual partnership between ICT players for further growth of the sector.